Polygonum cuspidatum &. Z. Siebold, ucc. Common Name: Japanese knotweed, Mexican bamboo. In Japan, known as itadori. Scientific Name: Polygonum cuspidatum (most common name in U.S. and Japan), also known as Reynoutria japonica (most common in U.K. and Europe), a movement exists to standardize name as Fallopia japonica. Identification: Japanese knotweed is an herbaceous perennial that grows very quickly on thick single stems, which appear reddish brown, and includes simple branches when large. Each joint is surrounded by a membranous sheath, making the joint seem swollen. Notable for extreme heighth of branches which arch over and remain, brown, through the winter. Clumps of dark green oval leaves grow 8-10 inches long, 3-6 inches wide, pointed at the tip. Small greenish white flowers appear in the full summer. Seeds are minuscule, reproduces predominately via rhizomes. New growth emerges through the dead brown stems of the previous season, leading to dense thickets. Original Distribution: Native to Japan, also North China, Taiwan, and Korea. Current Distribution: Much of mainland Europe, British Isles (except Orkney Islands), at least 36 states in USA including northeastern U.S., California, Pacific Northwest, and Alaska (but not Hawaii, and not usually found south of North Carolina), throughout Canada, Newfoundland, also New Zealand. Site and Date of Introduction: Intentionally introduced to UK from Japan as an ornamental in 1825 (according to Leslie Seiger, Nature Conservancy, Element Stewardship Abstract), from there made it to U.S. by late nineteenth century. 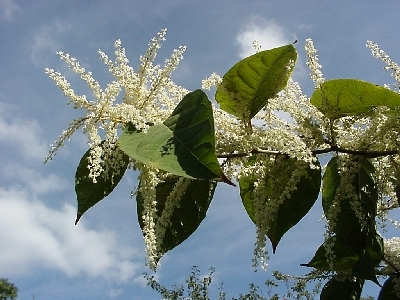 The Dutch botanist Houttuyn named the plant Reynoutria japonica in Japan in 1770, and it was not known until the late 1800s that Polygonum cuspidatum is identical (thus the disparity in scientific names). Mode(s) of Introduction: Spread by cuttings or pieces of rhizomes, often inadvertently as discards from gardens or carried along rivers or stream beds, where it can colonize extremely quickly after floods. 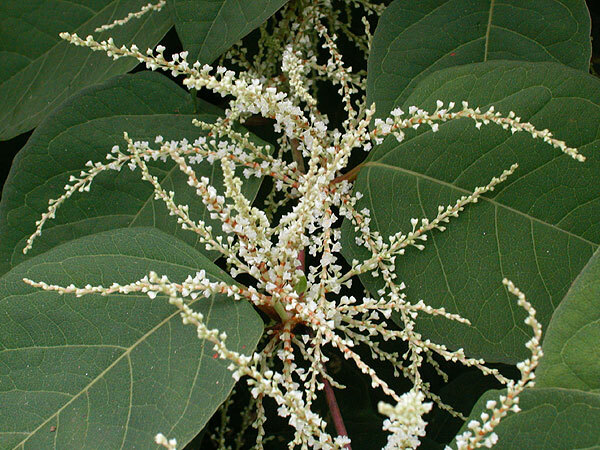 In Europe, only female plants are found, meaning that each example is a clone, making it one of the biggest females in the world in biomass terms (according to the Japanese Knotweed Alliance). Reason(s) Why it has Become Established: Grows extremely quickly: within 6 days, a viable plant exists from a rhizome as small as .7 grams, especially when rhizome is in water, which is why river/stream banks tend to get overwhelmed. It grows over 6 feet in first couple months of spring, shading out all other species around it. Even when the visible parts of the plant are cut away, the rhizomes sustain it, making it extraordinarily persistent. Can withstand almost all types of soil, light, and drought conditions. Rhizomes will survive to grow plant even if buried 3 feet deep, or under asphalt. Ecological Role: In Japan, it is one of the first plants to colonize volcanic areas, it's the "dominant pioneer in the primary succession of volcanic slopes and is frequently a colonizer in secondary succession," (The Nature Conservancy, Element Stewardship Abstract by Leslie Seiger, based on Hirose, 1984). Japanese knotweed has an incredible ability to grow anywhere and thrive under adverse soil conditions. In introduced areas, it helps prevent erosion. Since it reproduces primarily asexually, interactions with other species don't play a large role in the the plant's life outside its native habitat, although it is pollinated by bees and can be eaten by grazing animals. It is found predominately in wetlands, along roadways, and in abandoned areas that have been disturbed (according to the Nature Conservancy Element Stewardship Abstract. Benefit(s): Can be eaten, good source of vitamin C. Has been used as an ornamental plant along pathways and to create hedges. Due to quick growth and rapid reproduction, useful in erosion control. Also considered a medicinal herb, said to promote group consciousness, sensitivity and telepathy. Threat(s): Reduces biodiversity because forces out native plants through shade and thick ground cover, damages wildlife habitat by reducing plant biodiversity, expensive to treat, aesthetically displeasing, causes damage to sidewalks and pavement. Control Level Diagnosis : High Priorit y. Extremely difficult and time consuming to eradicate once it is established. Hybridization has already occurred on a wide scale, and the potential exists for much greater interbreeding/evolution, making it even more difficult to control. It has been declared a noxious weed in several states. Because the leaves and stems fall thickly and take a long time to decompose, no other plants (except the new Japanese knotweed shoots) can grow in an affected area. Has the real potential to wreck havoc on native ecosystems. Control Method : Thoroughly digging out roots and stems takes years to succeed, if it ever does -- if even a tiny speck of stem remains, the plant will regenerate. It is vital to burn or otherwise properly dispose of the plant scraps -- it can ruin a compost pile. It takes a minimum of three years to get rid of it, either by cutting away to the stems and treating each stem with an herbicide such as Roundup or by covering the ground with black plastic and heating the soil to the point where the rhizome dies. The shoots can be eaten by grazing animals, but this doesn't eradicate the plant, only control it. Types of biological control agents (BCA) are being studied; it is known that there are many insects and fungi which control the plant's spread in its native range, so prospects are hopeful (according to the Japanese Knotweed Alliance). Last Edited: February 17, 2003. Polygonum cuspidatum Siebold & Zucc. ©Elaine Haug. Provided by Smithsonian Institution, Department of Botany . United States, VA, Woodbridge, Occoquan National Wildlife Refuge. Usage Requirements . Britton, N.L., and A. Brown. 1913. An illustrated flora of the northern United States, Canada and the British Possessions. 3 vols. Charles Scribner's Sons, New York. Vol. 1: 676. Provided by Kentucky Native Plant Society . Scanned by Omnitek Inc . Usage Requirements . FAJA2 Fallopia japonica (Houtt.) Ronse Decr. This plant is listed by the U.S. federal government or a state. Common names are from state and federal lists. Click on a place name to get a complete noxious weed list for that location, or click here for a composite list of all Federal and State Noxious Weeds . STATE Assorted authors. State noxious weed lists for 46 states . State agriculture or natural resource departments. KY Haragan, P.D.. 1991. Weeds of Kentucky and adjacent states: a field guide . The University Press of Kentucky. Lexington, Kentucky. N'EAST Uva, R.H., J.C. Neal,and J.M. DiTomaso. 1997. Weeds of the Northeast . Cornell University Press. Ithaca, New York. WSWS Whitson, T.D. (ed.) et al.. 1996. Weeds of the West . Western Society of Weed Science in cooperation with Cooperative Extension Services, University of Wyoming. Laramie, Wyoming.